I get this question all the time! I even ask myself this question for my own home… The truth is, there is no right answer. But I’m breaking down all the reasons to say YES to a rug and some tips on picking out the perfect one for your dining room. We currently do not have a dining room rug and it’s killing me!! Okay, maybe that’s a slight exaggeration but I know how important rugs are visually to anchor a room. I’ve been torn though since I have a toddler and an almost 4 month old who will start eating real food very soon. And if I remember correctly, when Taylor started eating somehow food got on the floors, the walls, the table, the chairs, you get the idea… Yet, every time I look at my dining room, I think “it NEEDS a rug”. So we’ll see…. Below I’m answering a couple questions that you may have and some tips to guide you as you shop! What type of rug do I get? And which to avoid..
Flat-weave or low-pile for easy clean up. These are also easier to slide chairs back and forth on, hang on to less dust and tend to wear better so the rug will last longer overall. You don’t want something that will catch a lot of food and is hard to vacuum up. Basically, it’s smart to avoid anything heavy in texture and thickness. Stick to natural fibers that are easy to clean, such as wool or cotton. Note the easy to clean part (jute and sisal are also natural fibers but are much harder to clean especially if the texture is thick! See first bullet point if you MUST have one of these). Indoor/Outdoor Rugs – this is the type of rug I tend to favor for dining rooms for clients with young kids (and for our own home). Their washability and durability are key here. Consider carpet tiles! Especially if you are concerned with stains. FLOR, for example, has a variety of great, stylish options! You can wash these tiles in the bathtub, or replace one at a time if absolutely necessary. A lot more economical than replacing an entire rug. Which shape do I choose? This is an easy one, but may not be obvious to everyone so I included it just in case. 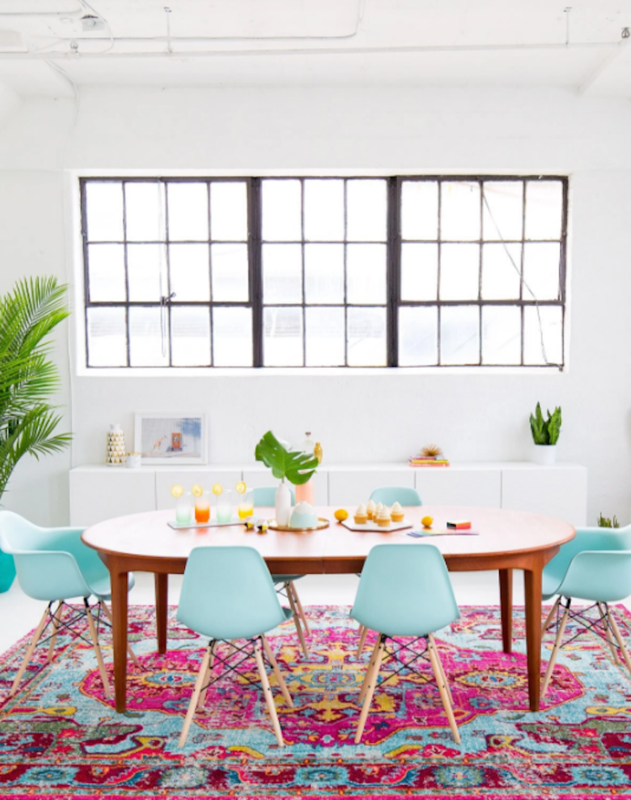 Match the shape of your rug to the shape of your dining table. Or, match the shape of your rug to the shape of the room. For example, round table, round rug. One exception is if you have an oval dining table, a rectangular rug is just fine. Now, which size do I get? A good rule of thumb is to make sure all the chairs can slide out and still be under the rug. If this doesn’t happen, it’s too small. This is usually 2 feet from the edge of the table. If you measured and are still wondering, I suggest going with the larger option. What about the dining area off kitchen and breakfast nooks? If you’re wondering if you need a rug under a table in the dining area off your kitchen or breakfast nook, it’s a great question (one that I also get very often!). Again, this is a personal preference but I DO like how rugs pull an area together and define a space. Depending on the amount of room you have, it might be a good idea to add a rug as long as you have enough space for it. This helps separate the spaces (kitchen vs dining). I did just mention this, but let me repeat it just in case, make SURE you have the space (measure!) for it before you go out and buy a rug. It can be very tricky with some layouts! If you’d like a little more guidance on which rug to get, feel free to send me a photo and I’m happy to help you out! Please send me any other design questions you have! I’m working on another one for you soon which I’ve been getting a lot lately and it has to do with one of my favorite things – wall paper!